Galileo was a scientist during the renaissance best known for a discovery that not only changed our worldview but our view of the entire universe. Before Galileo, it was an accepted “fact” that the Earth was in the centre of the universe and that everything moved around the Earth. This was known as the geocentric model of the universe. Not only was this the accepted worldview that was backed by the church, but suggesting that this model was wrong was blasphemy of the highest order. Galileo was not the first scientist to suggest that geocentrism was wrong, Nicolaus Copernicus firmly believed that the Earth and everything else revolved around the sun, known as a heliocentric model. However, Copernicus could not prove this idea fully. Galileo made many detailed observations of the planets using mathematical relationships to describe the motion of the heavenly bodies. 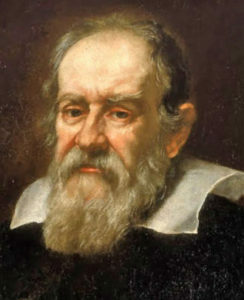 When Galileo finally decided to publish his work, the Catholic Church was not happy. He was charged with being a heretic. He was forced to renounce his views before spending the rest of his life under arrest. Of course, we now know he was completely correct and that the sun is at the centre of our solar system.